General Delos Bennet Sacket, son of Captain Gideon Shepard Sacket and Frances Electa Bush, was born on 14 April 1822.1 He died on 8 March 1885.1 He married first in 1847, Amanda Field.1 She died before 1854. He married second on 13 December 1856, Frances Ann Williams. Delos Bennet Sacket was a career soldier. He graduated from West Point Military Academy in 1845. During a distinguished career he gained rapid promotion, including that to Brevet Major General during the Civil War for gallantry in the field. He was appointed senior Inspector General of the United States Army in 1881 with the rank of Brigadier General. General Delos Bennett Sackett, U. S. A., was born at Cape Vincent, Jefferson County, N. Y., Apr. 14, 1822, and died at Washington, D. C., Mar. 8, 1885. He was the son of (1240) Gideon S. Sacket, and Frances Bush. In 1847 he was married to Amanda Field, who died prior to 1854. On Dec. 13, 1856, he was married to Frances Ann Williams, of New York City. Entering the West Point Military Academy in 1841, he was graduated therefrom with rank of Brevet Second Lieutenant in 1845, and assigned to 2nd Regiment of Dragoons; and within a year thereafter had won his first promotion of the battlefields of Palo Alto and Resaca-de-la-Palma, and on June 30, 1846, was commissioned Second Lieutenant and assigned to First Regiment of Dragoons. On Dec. 27, 1848, he was commissioned First Lieutenant. From Dec. 10, 1850, to Apr. 16, 1855, he was assistant instructor of cavalry tactics at U. S. Military Academy. On March 3, 1855, he was promoted to the rank of Captain in the 1st Cavalry. In 1856 he was made a member of board of officers selected to revise the U. S. Army regulations, and during a considerable part of the year 1856-7 served on frontier duty, in the Kansas disturbances. In 1848 [1858?] he participated with credit in the Utah and Cheyenne expeditions. On Jan. 31, 1861, he was advanced to the rank of Major of 1st Cavalry, and on May 3d following was commissioned Lieutenant Colonel of 2d Cavalry. On October, 1864, he was assigned to duty as Inspector General of the Army of the Potomac with rank of Colonel and served on the staff of the commanding general in the Virginia Peninsula and the Maryland and Rappahannock campaigns, participating in the principal battles. He seems to have held an exalted place in the estimation of General McClellan, who commends him most highly in several of his reports to the Secretary of War; in one of which he uses the following most suggestive language: "In heaven's name give me some generals who understand their profession. * * * Give me such men as Stephenson, Marcy, Sacket, and Lander, and I will answer for it with my life that I meet with no disaster." From Jan. 10 to May 26, 1863, Col. Sacket was in charge of the Inspector General's office at Washington, and subsequently, until March, 1864, was an active member of the board having charge of organization of Invalid Corps and the retirement of disabled officers. From April, 1863, to August, 1865, he was engaged in making a special tour of inspection of the departments of the Cumberland, Arkansas and New Mexico. On Mar. 13, 1865, he was breveted Brigadier General and Major General for "gallant and meritorious services in the field during the civil war." After the termination of the war he was Inspector General of the Department of Tennessee and of the divisions of the Atlantic and Missouri. On January 2, 1881, he became senior inspector general of the armies of the United Stated, with the rank of Brigadier General. Brig.-Gen. Delos B. Sacket, senior Inspector-General of the United States Army, died at his residence in Washington yesterday morning. He was born in this State, and was appointed to the Military Academy at West Point in 1840. He was graduated in 1845, and was at once promoted to brevet Second Lieutenant and sent to Mexico with his regiment, the Second Dragoons. In the charge upon the Mexican batteries at Palo Alto and at the battle of Resaca de la Palma his gallant and meritorious conduct caused him to be breveted First Lieutenant. He was also engaged in the battle of Monterey, in September, 1846. A brevet then counted for something, as it was only given for distinguished bravery under fire. From 1847 to 1850 he was on frontier duty in Arkansas and New-Mexico, receiving an appointment as First Lieutenant of the First Dragoons in 1848. While scouting against the Apache Indians in 1850 he won special distinction as an active and gallant officer. In December, 1850, Lieut. Sacket was assigned to duty as Assistant Instructor of Cavalry Tactics at West Point, where he remained until April, 1855. The next month he was promoted to Captain in the First Cavalry, and was sent to Kansas to aid in removing intruders from Indian lands. He was a member of the board to revise the Army Regulations in 1856, and in 1857-8 was again on frontier duty, this time engaged in quelling the Kansas disturbances. He was on the Utah and Cheyenne expeditions in 1858, and on the Antelope Hill expedition in 1859. After a year spent in Europe, he returned to duty at Fort Arbuckle, Indian Territory, when he was promoted to Major in the First Cavalry, in January, 1861. Later in the same year he was appointed Lieutenant-Colonel of the Second Cavalry and assigned to duty as Inspector-General of the Department of Washington. Early in October, he was made Colonel of Staff and Inspector-General. He served as recruiting officer in this city from August to December, 1861, when he joined the Army of the Potomac as Inspector-General. He served continuously with this army throughthe Peninsula, Antietam, Fredericksburg, and Rappahannock campaigns, taking part in all the battles and sieges, and to his work much of the splendid discipline of the army was due. In the Summer of 1863 he was a member of the board to organize the Invalid Corps. In 1864-5 he was assigned to duty in the Departments of the Tennessee, Cumberland, Arkansas, and New-Mexico, until placed upon the staff of Gen. Sheridan, when, in March, 1865, he was made a Brevet Brigadier-General for gallant services in the field,and the same day was made Brevet Major-General. In 1866 he was in the Department of the Tennessee. He was confirmed as Inspector-General by the Senate Jan. 21, 1881. Gen. Sacket was a man of fine presence, courtly in manner and soldierly in address, and was one of the most popular officers in the army. Gen. Sacket had been confined to his house by illness since Jan. 30. The immediate cause of his death was senile gangrene. He was born at Cape Vincent, N.Y., April 14, 1822. The funeral, which will be private, will take place on Tuesday afternoon, and a temporary interment of the body will be made in Oak Hill Cemetery. The final interment will be at Cape Vincent. Bvt. Second Lieut., 2d Dragoons, July 1, 1845.
on frontier duty at Ft. Arbuckle, I. T., 1860-61. 1865; and awaiting orders at New York city, Aug., 1865, to Apr. 4, 1866. General’s Department to Mar. 8, 1885. Died, Mar. 8, 1885, at Washington, D. C.: Aged 63. “It is with sincere regret the Secretary of War announces the death of Brig.-General Delos B. Sacket, Senior Inspector-General of the Army, which occurred at his residence in this city on Sunday noon, the 8th instant. “The loss of such an accomplished officer and gentleman cannot but be deeply regretted by the Army; his interest in its welfare, always active, remained to the end unabated. He possessed in an eminent degree that correct military spirit necessary to the efficient discharge of duty, and his precept and example exerted an influence which was highly beneficial to the service. “General Sacket was graduated from the U. S. Military Academy and appointed brevet Second Lieutenant, 2d Dragoons, July 1, 1845. He served in Texas during the military occupation of that State in 1845-46, and in the Mexican War, participating in the Battlers of Palo Alto, Resaca-de-la-Palma, and Monterey, and was brevetted First Lieutenant, May 9, 1846, for gallant and meritorious conduct in the two first-named battles. Promoted Second Lieutenant, 1st Dragoons, June 30, 1846, and First Lieutenant, Dec. 27, 1848. He was on frontier duty until Dec. 10, 1850, when he was detailed as Asst. Instructor of Cavalry Tactics at the U. S. Military Academy, where he remained on duty until Apr. 16, 1855, having been promoted Captain, 1st Cavalry, Mar. 3, 1855. In 1855-56 he served at Fort Leavenworth, and in removing intruders from Indian hands; in 1856-57, as a Member of the Board to Revise the Army Regulations; in 1857-58, on frontier duty and in quelling the Kansas Disturbances; in 1858-59, on Utah and Cheyenne Expedition and on Antelope Hill Expedition; and on leave of absence in Europe, and again on frontier duty, at Fort Arbuckle, Indian Territory, until the breaking out of the War of the Rebellion, having been promoted Major, 1st Cavalry, Jan. 31, 1861, and Lieutenant-Colonel of the 2d Cavalry on May 3, 1861. “From June 13, 1861, to Aug. 8, 1861, he was on duty as Acting Inspector-General, Department of Washington; then as Mustering and Disbursing Officer at New York city, to Dec. 13, 1861, when he was appointed Inspector-General of the Army of the Potomac (having been appointed Colonel and Inspector-General, U. S. Army, on Oct. 1, 1861), in which capacity he served until Jan. 10, 1863, participating in the Virginia Peninsular and Maryland Campaigns, and was engaged in the Battles of Gaines’s Mill, Glendale, Malvern Hill, South Mountain, and Antietam; and in the Rappahannock Campaign, in which he was present at the Battle of Fredericksburg. “During the period from Jan. 10, 1863, until Apr. 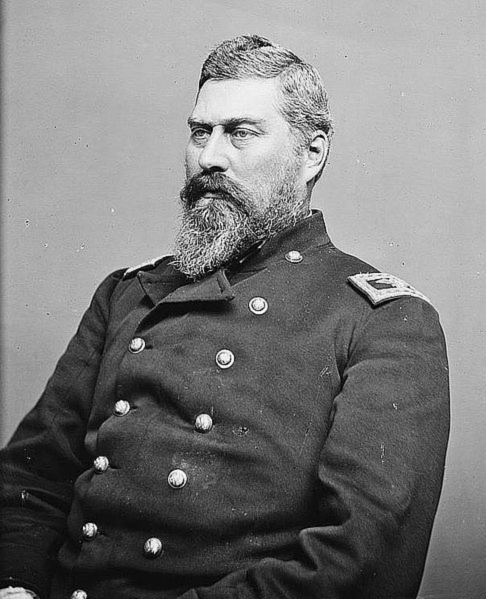 1, 1864, General Sacket was in charge of the Inspector-General’s Office at Washington; a Member of the Board to Organize the Invalid Corps; and on a Board to Retire Disabled Officers. From Apr. 1, 1864, to Aug., 1865, he was on inspection duty in the Departments of the Tennessee, Cumberland, Arkansas, and New Mexico. He was brevetted Brigadier-General and Major-General, U. S. Army, on Mar. 13, 1865, for gallant and meritorious service in the field during the Rebellion. In 1866 he made a tour of inspection through Montana to the Pacific Ocean; and was on duty as Inspector-General, Department of the Tennessee, from Nov. 9, 1866, until March, 18676; of the Department of the Cumberland, to Oct. 29, 1868; of the Division of the Atlantic, from Oct. 31, 1868, to Oct. 10, 1872, -- under the instructions of the Secretary of War, to July, 1876, -- and of the Division of the Missouri, from July 10, 1876, to Jan. 12, 1881, and was appointed Brigadier-General and Senior Inspector-General of the Army, Jan. 2, 1881. Source: Website US Mexican War (Corpus Christi Public Libraries) (http://www.library.ci.corpus-christi.tx.us/MexicanWar/sacketdb.htm). SACKET, Delos Bennet, soldier, born in Cape Vincent. New York, 14 April, 1822; died in Washington, D. C., 8 March, 1885. He was graduated at the United States military academy in 1845, assigned to the 2d dragoons, and served in the Mexican war, being brevetted 1st lieutenant, 9 May, 1846, for gallant and meritorious conduct at Palo Alto and Resaca de la Palma, Texas On 30 June, 1846, he became 2d lieutenant, and he was made 1st lieutenant on 27 Dec., 1848. He was engaged in scouting in 1850, and was assistant instructor of cavalry tactics in the United States military academy from 10 December, 1850, till 16 April, 1855. On 3 March, 1855, he became captain of 1st cavalry. He was a member of the board to revise the army regulations in Washington in 1856-'7, served on frontier duty in the Kansas disturbances in 1856-'7, and on the Utah and Cheyenne expedition in 1858. He was appointed major of 1st cavalry on 31 January, 1861, lieutenant-colonel of 2d cavalry on 3 May, 1861 and inspector-general on 1 October, 1861. Joining the Army of the Potomac, he served on the staff of the commanding general in the Virginia peninsula and the Maryland and Rappahannock campaigns, participating in the chief engagements. He was in charge of the inspector-general's office in Washington, D. C., from 10 January till 26 May, 1863, and afterward a member of the board to organize invalid corps and treat for retiring disabled officers. From 1 April. 1864, till August, 1865, he was on inspection duty in the departments of the Tennessee, Cumberland, Arkansas, and New Mexico. On 13 March, 1865, he was brevetted brigadier-general and major-general for gallant and meritorious services in the field and during the civil war. After the war he was inspector-general of the Department of the Tennessee and of the divisions of the Atlantic and the Missouri. On the retirement of General Randolph B. Marcy on 2 January, 1881, he became senior inspector-general of the army with the rank of brigadier-general. Source: Website Virtualology.com, Appleton's Cyclopedia of American Biography (edited by James Grant Wilson, John Fiske and Stanley L. Klos. Six volumes, New York: D. Appleton and Company, 1887-1889 and StanKlos.com 1999.) (http://famousamericans.net/delosbennetsacket/). See also Wikipedia, Delos Bennett Sackett. Charles Weygant, The Sacketts of America, "3150. Delos B. Sacket, b. Apr. 14, 1822, d. Mar. 8, 1885; m. Amanda Field." Website Sue Greenhagen's Website (http://www.morrisville.edu/library/local_history/images/…). Website US Mexican War (Corpus Christi Public Libraries) (http://www.library.ci.corpus-christi.tx.us/MexicanWar/…). Website Virtualology.com, Appleton's Cyclopedia of American Biography (John Fiske and Stanley L. Klos. Six volumes, New York: D. Appleton and Company, 1887-1889 and StanKlos.com 1999. edited by James Grant Wilson) (http://famousamericans.net/delosbennetsacket/).